No soft goods the first time. It would be nice to know the pricing ahead of time. Otherwise there will be a little bit of math thrown in to the mad dash to buy figures before they sell out. 2. Kickstarter supporters get first crack on the first day--will amount to a few hours-- and (depending on the price), at discount. 3. When the sale goes wide, keep the same limits in place and by such time (hopefully), the supporters will have theirs and less likely to be sold to just resellers buying dozens or more. After the first full day or so, remove the limits to sell out the rest. This in my mind would be the right way to run any of these sales. The "feeding frenzys" are just as much a product of lack of limits and safeguards as it is the popularity of the line. I know the Horsemen don't want to get stuck with unsold product, but at this point I'm sure we all realize that's not likely to happen. DennyCrane wrote: This in my mind would be the right way to run any of these sales. The "feeding frenzys" are just as much a product of lack of limits and safeguards as it is the popularity of the line. I know the Horsemen don't want to get stuck with unsold product, but at this point I'm sure we all realize that's not likely to happen. They aren't thinking clearly if they think there's any chance of keeping significant unsold product. Everything except the troll sold out almost immediately when Coliseum went up. AoD will probably go even faster. From a buyer's standpoint, it is good to consider a sellout as guaranteed. Get what you can, when you can, because it won't be there long. However, from a seller's standpoint, a sale is only guaranteed once the money is in hand. We can say "they arent thinking clearly" all day long, but the fact is, not everything the 4H have put up sold out quickly. Not everything they put up sold out. Realistically, on something limited like these, a sellout really is a foregone conclusion, but people try to ignore the times the 4H didn't sell everthing. Wish they would put these up in the Store before the sale goes live so we can see them. Honestly there is only one I feel I MUST get. Not saying which one, but maybe another one if the price is right. We will see tomorrow night I suppose. Do the test shots come packaged in the regular art packaging or polybagged? Found an old advert saying they were bagged but recent auction listings are carded. The original first test shots were poly bagged. The ones showing up carded were done by someone after they bought it. Ah I see. A custom job. Kinda figured that for the case. Thanks for confirming. Speaking of...has the new package art for AoD been shown yet? 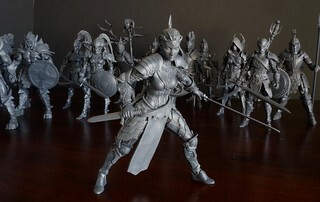 MYTHIC LEGIONS: ADVENT OF DECAY TEST SHOTS SALE TONIGHT!! Tonight (Thursday, August 16th) at 9pm EST an extremely limited amount of Mythic Legions: Advent of Decay test shots are going to be going up for sale exclusively on StoreHorsemen.com. These incredibly rare pre-production figures will come poly-bagged and fully accessorized. sale is tonight folks, and a far more reasonable price that people were doomsaying. did we ever get a full list of what all test shots there will be?